Tropolism's Editor, Chad Smith (aka me!) 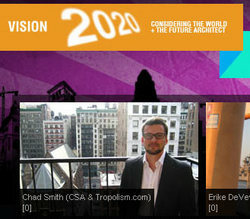 was asked to participate in Vision 2020, a set of small questions asked to a large pool of architects about the future of architecture. My answers are found here, and will hopefully be no surprise to regular readers of Tropolism. This will hopefully be the last time you see a picture of me in a post here, I don't like getting too meta.